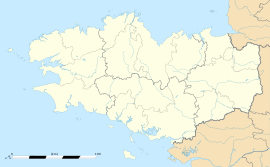 Callac (Breton: Kallag) is a communes in the Côtes-d'Armor department in Brittany in north-western France. Callac is located 30 km (19 mi) south-west of Guingamp and 20 km (12 mi) north-east of Carhaix, Finistère. Inhabitants of Callac are called Callacois in French. Wikimedia Commons has media related to Callac.